Institution:Royal Hallamshire Hospital, Glossop Road, Sheffield, S10 2JF, U.K. Many trials have undertaken Intra-oesophageal manometry (IEM) as a measurement of adequacy of fundoplication. 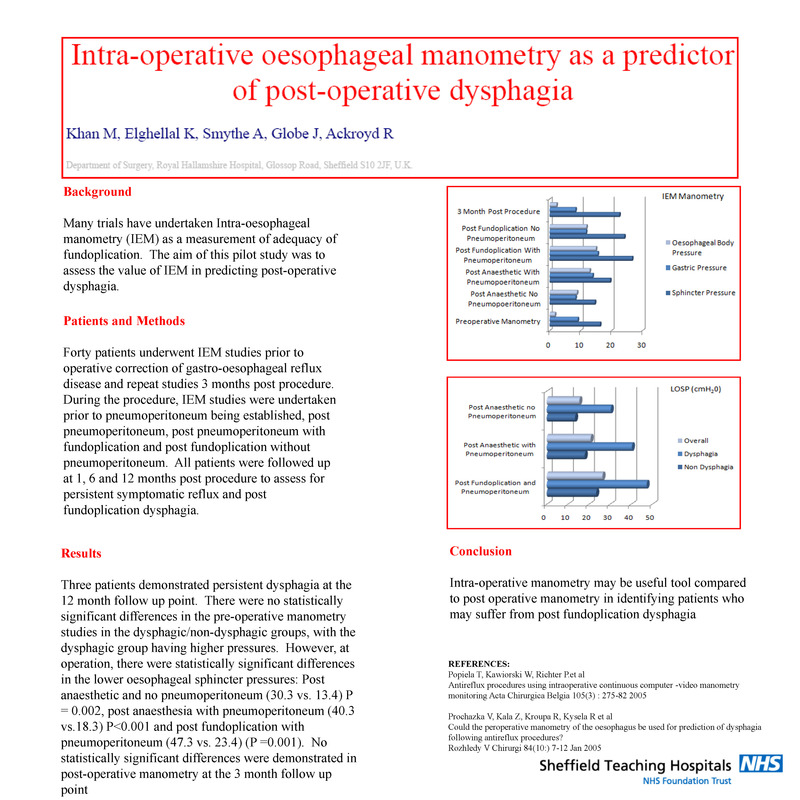 The aim of this pilot study was to assess the value of IEM in predicting post-operative dysphagia. Forty patients underwent IEM studies prior to operative correction of gastro-oesophageal reflux disease and repeat studies 3 months post procedure. During the procedure, IEM studies were undertaken prior to pneumoperitoneum being established, post pneumoperitoneum, post pneumoperitoneum with fundoplication and post fundoplication without pneumoperitoneum. All patients were followed up at 1, 6 and 12 months post procedure to assess for persistent symptomatic reflux and post fundoplication dysphagia.